Horizon FALCON 7mL Sub-Ohm TankHorizon Falcon Sub-Ohm Tank is the new flagship Sub-Ohm atomizer from.. Horizon Falcon Resin-Artisan Edition TankSTRONGER. CLEANER. NEW RESIN-ARTISAN MATERIAL.Horizon Falco.. Horizon Falcon RESIN TankHorizon Falcon Resin Tank features an intricate resin design with rainbow b.. Horizon ARCO II T6 0.2 Ohm 3pk CoilsHorizon ARCO II T6 0.2 Ohm 3pk Replacement Coils for the ARCO II.. Horizon ARCO II Sub-Ohm Tank With Resin TipHorizon Arco 2 Sub Ohm Tank Atomizer, the latest sub ohm .. Horizon ARCO 3pk CoilsHorizon ARCO 3pk Replacement Coils for the ARCO Sub-Ohm Tank. Available i.. Horizon DUOS Sub Tank 3pk CoilsHorizon DUOS Sub Tank Replacement Coils, available in 3 packs.Availab.. Horizon DUOS Sub Tank Colored GlassColored replacement glass tubes for the Horizon DUOS Sub Tank.Ava.. Horizon Cerakoat Clapton X3 Coils 5 Pack.3+-.1oh, 30-50w.. Horizon Arctic V8 Mini Specialty Coil Sub-Ohm TankThe Horizon Arctic V8 Mini Sub-Ohm Tank is one of ..
Arctic V8 Snake Coils - 5 packKanthal.35ohm +- .0540-70w..
Arctic V8 Tiger Coils - 5 packKanthal.35ohm +- .0560-80W..
Ni200 TC Coils for the Arctic V80.2 ohms at 212-572FJapanese Organic Cotton..
V1 - Bottom Vertical Single Coil Stainless Steel Wire0.2 ohms at 50 to 70W 0.5 ohms at 40 to 60.. Horizon Arctic V8 TankTop RefillStainless Steel TankSpiral Splash Proof VentCapacity: 4mLRTA Optiona..
Ni200 TC coil (3 coils x 1)NickelWatts: 100-300WOhms:.1-.3ohmsTemperature Range: 212-572 F..
Clapton coil (3 coils x 1)Watts: 45-135WOhms:.5-1.5ohms.. 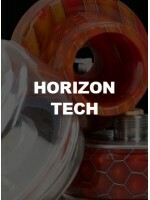 Horizon Arctic Turbo KitPioneered sextuplet coil (3 pieces interchangeable dual coils)Top Turbo Cool..
Phantom Micro tank Horizon Phantom Micro tank is an advanced and revolutionary sub ohm tank, &.. The Horizon Phantom Sub-Ohm Tank is the evolution of the Arctic Sub-Ohm Tank, introducing a two.. Coil must be used with compatible electronics with temperature controlNickel 200 Coil0.2ohms20-80 wa..
Arctic 5 Pack .2dual - .5dual.. The CERAKOAT by Horizon featuresHorizon Cerakoat Tank is top-fill tank and is insulated in two..